Who knew that the best butterscotch blondies could rival the rich, deep taste of a chocolate brownie? I admit that I did not. Oh, you didn’t think so either? Try these soft and chewy bars once and you’ll learn like I did that you could eat a half dozen of these and STILL want one more. Yes, I speak from experience. These blondie bars are THAT good. A blondie dessert is simply a baked dessert that is similar to a chocolate brownie. It’s also called a blonde brownie or a blondie. The difference in ingredients between a blondie and a brownie is that blondies swap out vanilla or butterscotch flavors instead of cocoa. The sweet, chewy familiar feel still remains. Baking this homemade blondie recipe might even challenge your love of chocolate brownies! 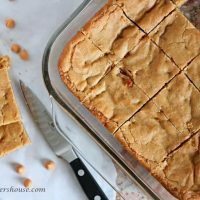 I followed a Cooking Light recipe for these butterscotch blondies bars. My only addition was to include a generous handful of butterscotch chips for a bit of texture. 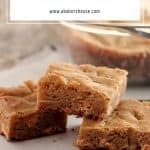 I loved the chips but if you don’t have any at home, make these anyway because the sweet, chewy bites of these blondies is not to be missed. The butterscotch flavor of these Cooking Light butterscotch bars comes from the butter along with the brown sugar. Let the butter brown slightly then incorporate the other ingredients. Yes, it is a lot of sugar—even more sugar than flour—but go with it. And don’t skimp on the butter either! 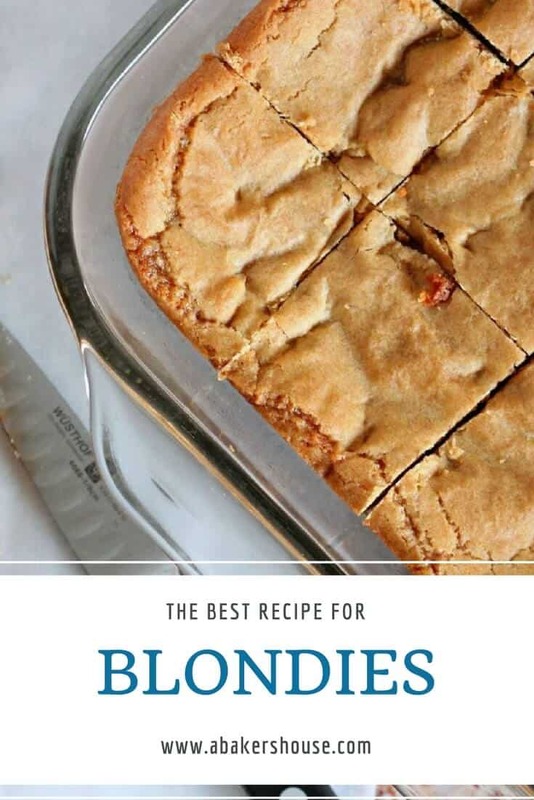 These blondies are a crowd favorite. Blondies are similar in texture to their more popular cousin, the brownie. They are chewy and rich in flavor. Butterscotch brownies are good to make ahead then to take along to a picnic, a family function, a day at the beach. My batch of butterscotch blondies is gone but I may make them again for a school function this week. The parents and kids alike will love this dessert! 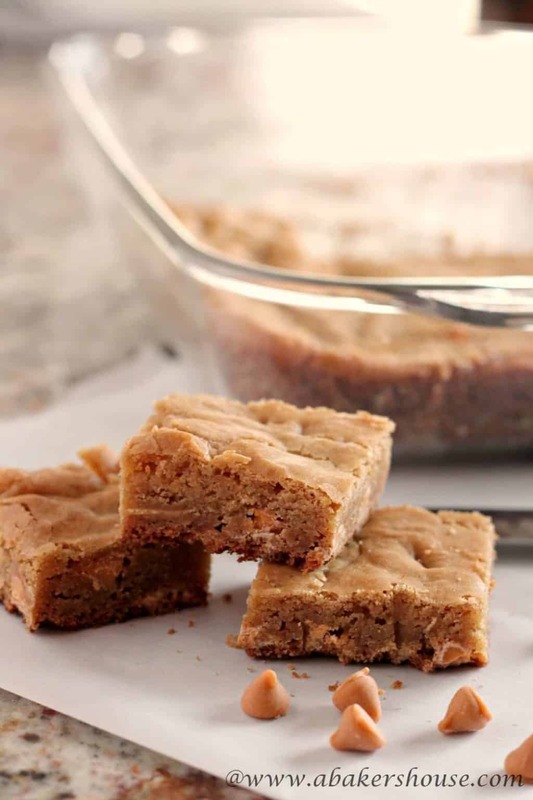 This Butterscotch Blondies recipe will become one of your most requested treats. 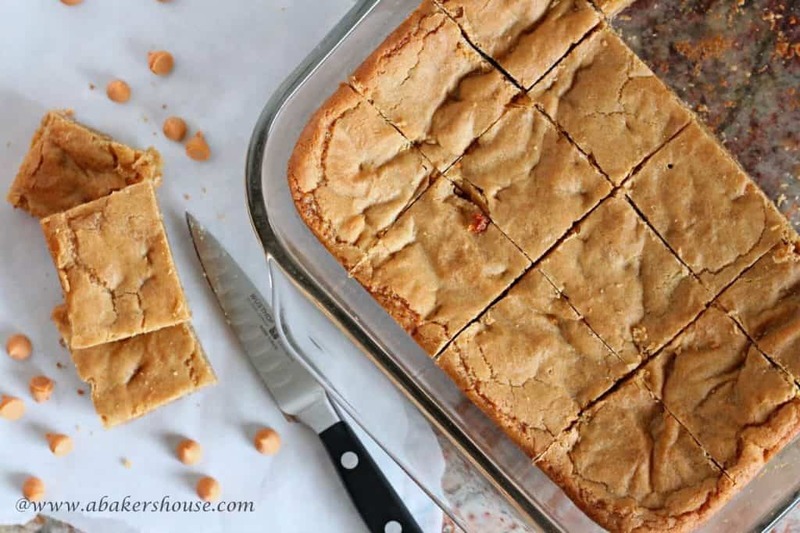 Made in a 9 x 13 pan, these blondies can be cut into squares or bars and will feed a crowd. This recipe has a step where you essentially make brown butter. This is a process in which you simply melt the butter, letting some of the water content evaporate until you are left with a nutty, fragrant melted butter. You can make a light, medium or dark brown butter as is explained in this article by Bon Appetit. You are not making a traditional butterscotch with this method but the taste that the brown butter lends to the blondies will remind you of butterscotch. Adding in butterscotch baking chips provides an additional texture and flavor. Find the original recipe from Cooking Light magazine. Combine the dry ingredients: flour, brown sugar, baking powder, and salt. Whisk together and set aside. Melt the butter in a small saucepan on medium low heat. Cook for 5 minutes, stirring a few times, until the butter has a nutty smell and turns a golden brown. Take off heat and let it cool for 10 minutes. Add the eggs to the butter then mix in the dry ingredients until just incorporated. Mix in the chips. Use cooking spray to grease a 9 x 13 pan. Preheat the oven to 350 degrees F. Pour the batter into the pan and smooth to the edges. Bake for 30 minutes. Are you looking for a gluten free alternative using the fantastic flavor of BUTTERSCOTCH? Try these Gluten Free Butterscotch Cookies. Or perhaps you’d prefer the traditional recipe for butterscotch cookies. Take a bite! because you’ll return to this recipe again and again! I love brownies but they are a bit heavy sometimes. Looks like you’ve come up with a solution for that. I can’t wait to try these. i’m just like u, a bit skeptical about blondies versus their notoriously popular cousin the brownies. But this gorgeous picture is making me think twice! Yes I completely understand, it’s hard to veer from the ever-popular brownie, but try it once and you’ll see what I mean! Thanks for reading. Well aren’t these fantastic, Holly! I love butterscotch. I bet I’d love these! Sounds so good! I love butterscotch. Plus they look like the perfect consistency.